The PCAOB has conducted inspections of one or more registered firms located in Malaysia in the past. "The Board began talking about these issues with its non-U.S. counterparts not long after its establishment, and adopted a cooperative framework that allows the PCAOB to rely, to a degree deemed appropriate by the Board, on inspection or enforcement work performed by a home-country regulator." Now in Malaysia, the role of the home-country regulator is played by the Audit Oversight Board. "We know there was a dinner at the home of the Chairman of the SC in Taman Bukit Pantai, KL, where the guests were the MD of PwC, Mr Chin Kwai Fatt and an Executive Director of the same firm, a Mr Manohar Benjamin Johnson. We have here a curious case, in which a Director from the largest Audit Firm in the country was appointed to basically run the oversight body which is responsible for overseeing all Auditors of Public Interest Entities, including the firm that had employed him prior to the appointment, in that they fulfill the 'fit' and 'proper' criteria, and also to protect the interests of investors by promoting confidence in the quality and reliability of audited financial statements of PIEs." Can the PCAOB rely on the inspections and the enforcement work conducted by the AOB, in any future inspections it may conduct on any registered firms located in Malaysia? 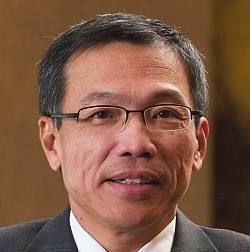 Can the PCAOB accept the inspections and enforcement of the AOB , when Mr Chin Kwai Fatt, the MD of PricewaterhouseCoopers Malaysia had a hand in who was to run the AOB? Subsequent to that, PricewaterhouseCoopers Malaysia was registered by the AOB, under circumstances which made the registration a legal and a physical impossibility. 1. How was the firm of PricewaterhouseCoopers (PwC) and Mr Cho Choo Meng of that same firm, registered by the AOB on the 1st of April, under Section 31s (1) SCA,when the board members themselves were only appointed on that very same day?" Questions were then asked of the regulators, as well as the Global Leaders of PricewaterhouseCoopers as to the fraudulent acts of PricewaterhouseCoopers in Malaysia, with regards to the sale of the Global Consulting Business of PricewaterhouseCoopers to IBM Corp in 2002, as well as to the validity of the audits conducted by PricewaterhouseCoopers on IBM in Malaysia as well as globally. As has Mr Coenraad Van Beek, Global Leader for ethics and Business Conduct in PwC. Questions were also asked of PricewaterhouseCoopers LLP and it's office of General Counsel in New York, as to why they have remained silent on the continuing fraud by PricewaterhouseCoopers in Malaysia, though they were made aware of the fraud as far back as in 2003. We have seen a serial failure of both self regulation as well as external regulation to question and investigate allegations of unethical and fraudulent acts by the Country Managing Partner, the Executive Chairman as well as other Senior Partners of PricewaterhouseCoopers in Malaysia; despite the prevalence of charters like the PwC Code of Conduct and legislations that have no real impact on the behaviour of these goons.